Well, your on-line image is important, and it’s easy to lose control of it. If you’re in business, “Yourself” also means “Company.” It’s important to monitor what people see when they Google you. The trouble is, Google tries to give you the best result for you. It uses everything it’s got, and bends the results to favour things it thinks you want to see. This is usually fine when you search for a restaurant or another business, but not when you search for yourself. You need to see what others would see. Web browsers these days have a Private Browsing mode. At the end of this post we’ve included some hints on how to turn it on in different browsers. to buy your spouse’s birthday present. Beware: You’re still leaving some sort of trail behind on the search engine’s server, so if you want total privacy you need to look further than we can tell you. But that’s not the end of the story! 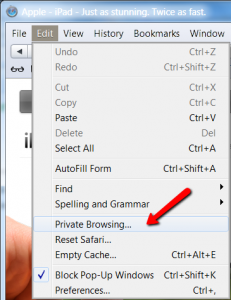 Open a private browsing window (see below for how to do this with your favourite web browser). Almost ready: tell the search engine where want to be for your experiments. In this Google example, it knows I’m in Portishead so it might show me results for this area when I don’t want it to. Click “Search tools” (1) and then use the drop-down (2) to choose the location you want. The default location is that of your ISP’s server. Ours is in Guildford, Essex, so it isn’t much use for my local searches anyway. You can enter a post code, county, city, or UK. Google will tell you if it doesn’t recognise the area you’ve chosen. Now do an Image search, and Maps – see right. Did you like what you found? Yes? That’s OK then. If you didn’t, then it’s time for a chat with your marketing guys! 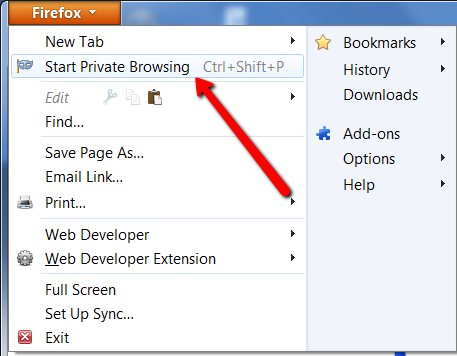 Most browsers support the shortcut, Ctrl-Shift-P. Here’s a selection of other ways to start it. They all open a new window or tab. 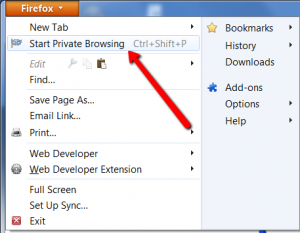 Click the Firefox button, then Start Private Browsing. If you’re using the menu bar, it’s under Tools. Click the Tools icon, then Safety>, InPrivate Browsing. It’s also in the File menu. Curiously, Apple has it under the Edit menu, though it does just the same as in other browsers. Opera button, Tabs and Windows; now choose New Private Window or Tab. This entry was posted in Wider Internet Issues and tagged private browsing, Search on November 19, 2012 by Dave Fielden. Want to be notified about other useful website related stuff? We won't email often, send you any junk, or share your details with anyone else.